Marriott Rewards has a promotion for stays at four participating Gaylord hotels between February 3 and April 27, 2014. You can earn 2,000 bonus points per stays (can be as short as one night) by booking using offer code M11. The M11 rate is $30 higher than a discount one for the night in question. The extra bonus points are not worth the additional cash. You always must check all the discount rates in order to find the most suitable one. Sometimes these extra points rates makes sense and sometimes, like this example above, they don’t. Stays must be booked between January 20 and April 20, 2014. Price is per room, plus tax (Osceola County assessment fee applies for Gaylord Palms), resort fee and parking. Atrium upgrade may be available at prevailing rates. Offer does not apply to groups. Offer cannot be combined with any other promotion. Advance reservations required. Not retroactive. 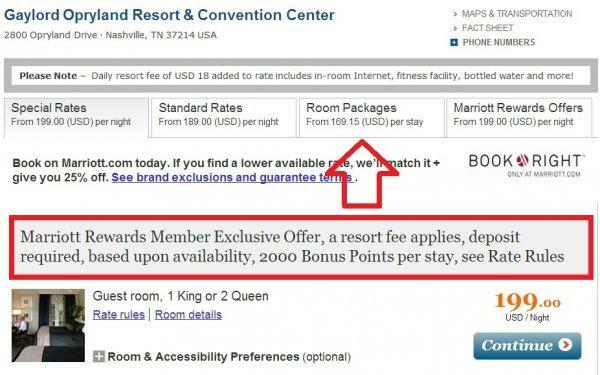 Guest must book reservation using promotional code listed above in order to receive bonus points. Offer applies to one regular room per stay, per member from February 3 – April 27, 2014. A “hotel stay” or “stay” means all consecutive nights spent with Marriott by a registered Marriott Rewards member. Subject to limited availability. Special offers cannot be combined; blackout dates may exist. Other restrictions may apply. Members electing to earn miles are not eligible for this promotion.